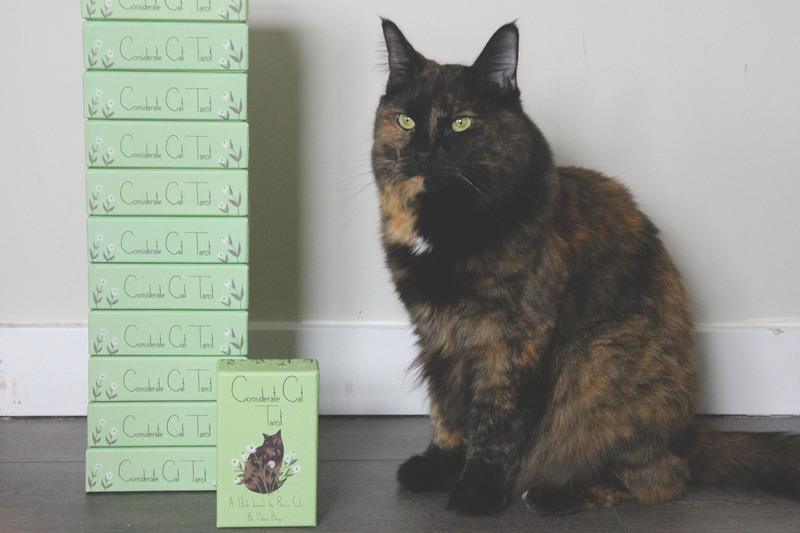 Welcome to Considerate Cat Tarot! I started this deck as a project for myself close to two years ago. I was in art school for a year before I switched to a different program. (Why did I do that?!). I found the best way to improve my skills was to focus on one project that would carry me through a long period of time. I loved it when you had a semester long project and you’d work on one thing for that time period. So I assigned myself a tarot deck project. The “78daysofcattarot”. It took about a year to complete the whole thing and originally, I had never intended to publish it. I had no idea people would want it! That seems silly now but everyone was asking about the deck and if I was going to publish it. So I actually submitted to a traditional publisher. One of the big ones that publishes quirky notebooks and board games. They replied pretty quickly and said they really loved my work but they had something similar coming out that year so they wouldn’t be able to move forward with my project. I was sad for about a day, and then I shared my rejection with everyone on social media. I had a friend reach out and say to me ” What are you doing, why don’t you self publish?” Which I immediately felt was just exhausting. But of course, it ended up being a way better way to go in the end. A publisher would have taken a lot of my creative licence. They wouldn’t have allowed me to part of many of the steps taken to publish and it would still be in production instead of in everyones hands as it is now. Thank you so much!! Butters paws 🙂 He’s such a little lion.